Brian works with youth and adults to facilitate return-to-sport and healthy, active lifestyles, with particular interest in throwing injuries (baseball, softball) and high-intensity workouts. 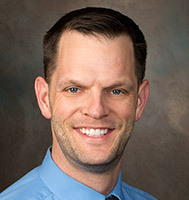 Brian is a board certified orthopedic physical therapy specialist by the American Physical Therapy Association (APTA). He also is certified by the National Athletic Trainers' Association as an athletic trainer, by The McKenzie Institute for Mechanical Diagnosis and Therapy, and as a strength and conditioning specialist by the National Strength and Conditioning Association (NSCA). Brian is licensed by the state of Wisconsin to practice physical therapy and sees patients upon referral.